Paperless Automation technology empowers the AP department. When AP technology is fully integrated with an ERP solution, such as Microsoft Dynamics GP, accounting is in the best position to use the efficiency and visibility that AP technology cultivates to empower the C‐suite to make sound, informed decisions. The accounting function is best positioned to elevate itself from a cost center to a revenue driver by enabling leadership to drive measurable return on the organization's ERP investment. Efficiency - An efficient P2P process means timely purchase orders, invoice approvals and payments, and satisfied stakeholders. Cost savings - Savings opportunities, such as early‐payment discounts and avoidance of late‐payment fees, are benefits of an efficient P2P process. Transparency and visibility - Finance executives can gain real‐time knowledge and visibility into the "spend" side of the organization to uncover opportunities for improvement. Intelligent use of reliable data - Invoices and supporting documentation can be inputted, transmitted and shared within the AP department and across the enterprise so that the intelligence, accuracy and integrity of data is preserved and used to support decision making. Talent management - The accounting department's best employees can be matched with the right responsibilities. Ohio Masonic home is a nonprofit organization that offers three lifestyle communities in Ohio. With three campuses in three in three cities across the state, invoicing was messy, inefficient and inaccurate. The goal: to streamline old and unproductive processes in order to meet the demands of suppliers and process invoices in a more timely fashion. Ohio Masonic Home took a hard look at their processes and implemented MetaViewer, which integrated tightly with their Microsoft Dynamics GP solution. The system provided accessibility to all of their financial data and led to time and cost savings, as well as dramatically less frustration for the accounting and AP teams. They also experienced at least 10,000 hours of labor savings just on invoice processing, and over $250,000 in hard savings. They've also cut down accounts payable processing by at least three hours. 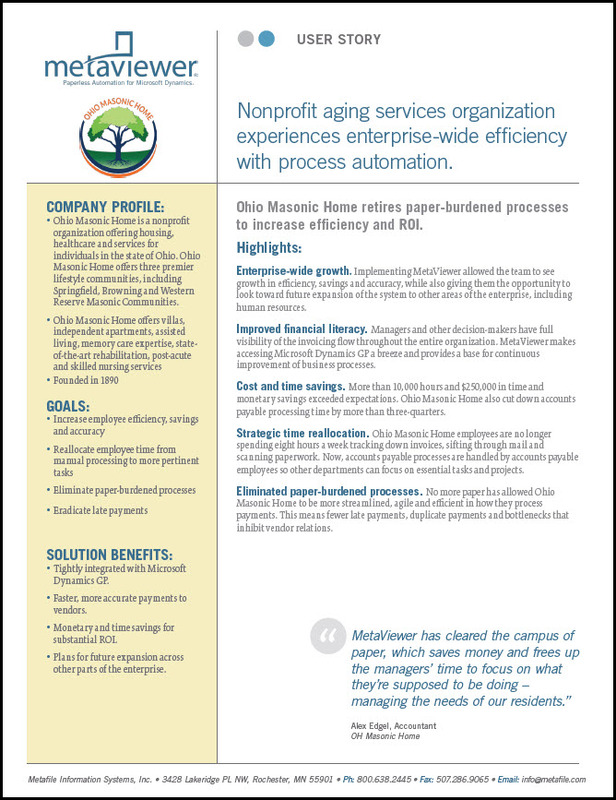 Want to learn more about how paperless automation from MetaViewer changed Ohio Masonic Home's AP department for the better? Download the full case study. Microsoft Dynamics GP has a target market of companies with an annual revenue of $5 million to $1 billion and has the most extensive third-party offerings.